Bathe in burlap goodness with these stunning jewelry boxes that will wow your customers. Every jewelry shop has a particular theme they follow when it comes to the shop interior and even their products in general. If you are one of those shops who are into the rustic chic style, your store probably has a lot of decors and jewelry displays in burlap as well as other nature-inspired elements. We all know that packaging is the extension of your brand, so it’s best to place purchased items in something with a natural charm. If you think burlap pouches are a bit too shabby for your brand, no worries. We have deluxe burlap boxes that will definitely complement your rustic chic brand. 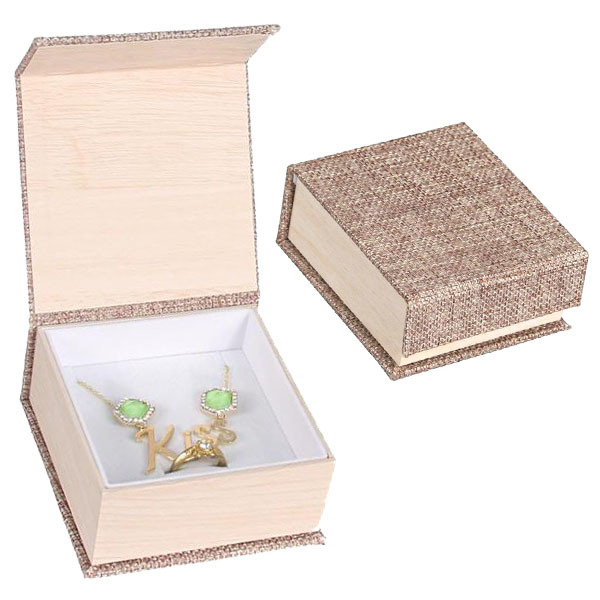 This is something that will match your necklace display -- the Deluxe Burlap Earring and Pendant Box. 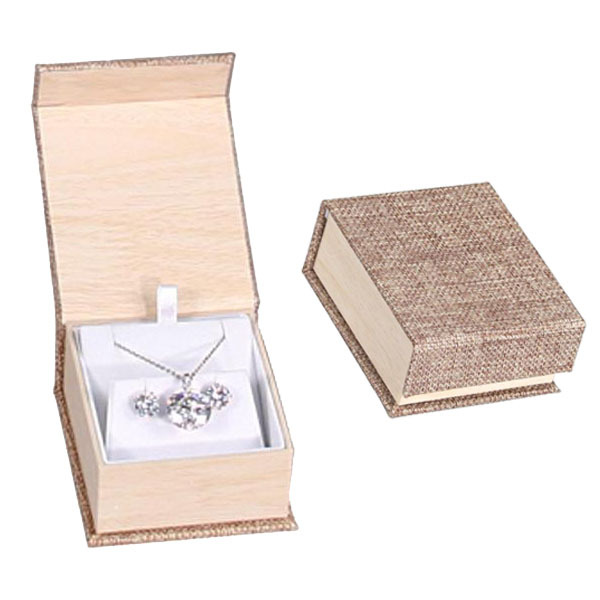 This cute little box can hold a pendant necklace and a pair of earrings. Its size dimension is 2 3/4" x 3 1/4" x 1 3/8"H, so it's a handy little box that looks perfect as a gift box too. 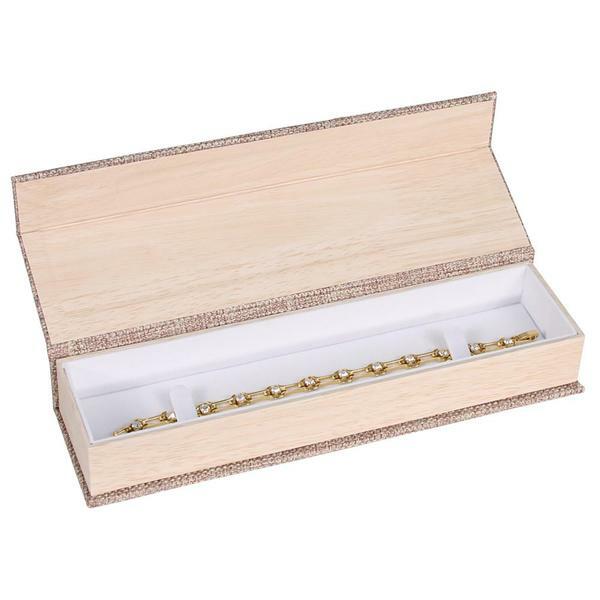 The Deluxe Necklace Box can hold a necklace and can also double as a jewelry display. It can make the piece stand out because of its white interior. This box’s size dimension is 4 5/8" x 7 1/2" x 1 ⅜” so it can showcase even the longest of necklaces. 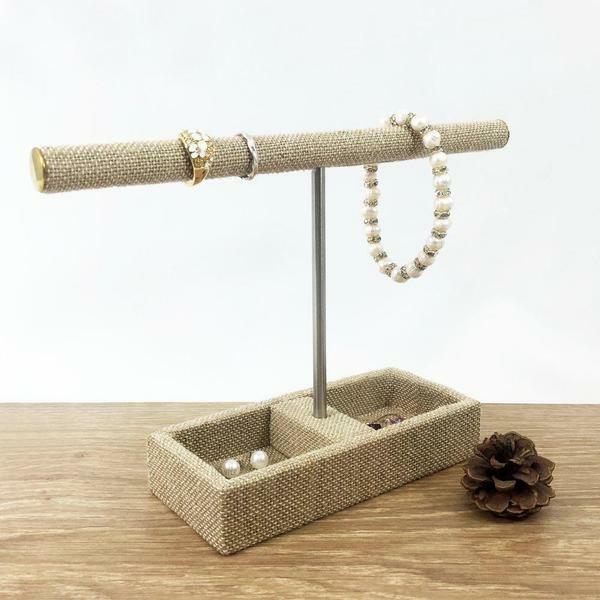 A perfect box to hold an engagement ring, the Deluxe Burlap Ring Box can make any piece look even more charming. Its size dimension is 2 1/8" x 2 3/8" x 1 3/4"H, so it’s not that bulky, and the men won’t have a hard time hiding it from their future fiancees! Whether it’s a bracelet or a women’s watch, this Deluxe Burlap Bracelet Box can hold the piece perfectly. It allows the bracelet to be laid out flat, so people can admire it even without touching it. The box has two clips on either side to secure the piece inside. Its size dimension is 8 5/8" x 2 3/8" x 1 1/4"H.
As for watches or thicker bracelets, for that matter, this Deluxe Burlap Watch Box is the best one to use. 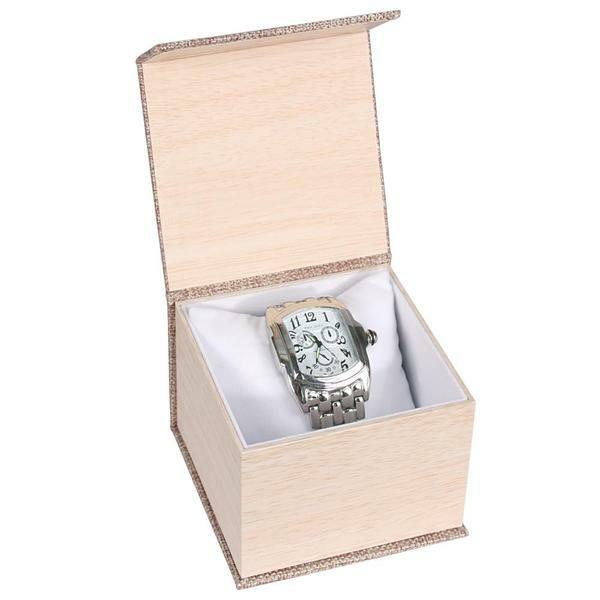 It comes with a watch pillow so you can place the piece securely and nicely inside the box without it getting scratched or damaged. 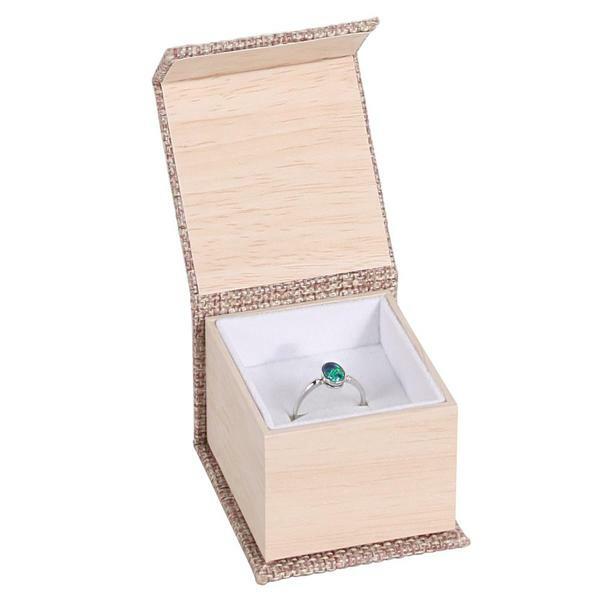 Its size dimension is 4" x 4 1/8" x 3"H.
Finally, we also have a box that can carry a ring and a pendant necklace. 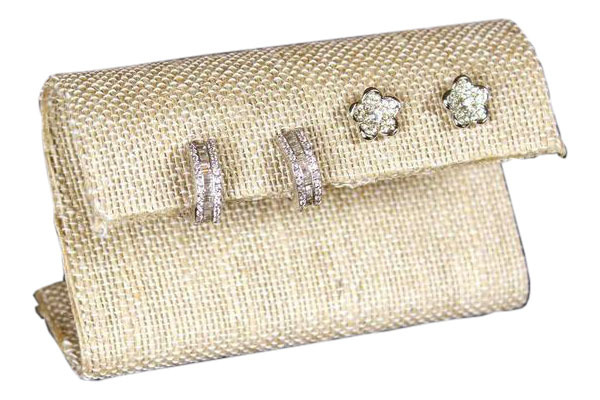 The Deluxe Burlap Ring and Pendant Box can showcase a two-piece set of the same design without them getting tangled inside. The ring slot is conveniently placed below the necklace slots. This box’s size dimension is 3 1/2" x 3 1/2" x 1 3/4"H.
Want to see more burlap jewelry boxes? Check out NileCorp.com for a vast array of jewelry boxes, pouches, earrings displays, necklace displays, among many others! Here are the reasons why these displays are one of the best types to use. One thing that makes a jewelry shop stand out is how they display their items for sale. The display should catch the passers-by’s eyes the second they turn their heads to your shop. That said, investing in good displays should be a part of any jewelry brand’s marketing strategy. 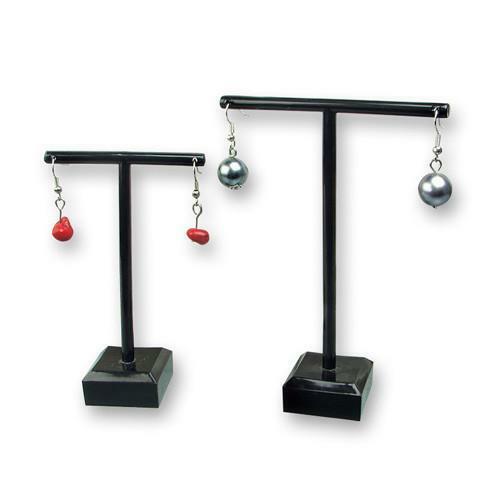 Jewelry displays come in many styles, colors, and sizes. One popular material today is the burlap linen. Burlap is a woven fabric made from sisal fibers or the skin of the jute plant and combined with other fibers. What you get then is an earthy-colored fabric. This week, we are highlighting burlap linen displays and why they make great displays. Burlap linen is eco-friendly because it’s made from sustainable materials. It is also more organic in nature, disposable, and biodegradable. Although it has these qualities, it doesn't mean that they are not durable. In fact, the natural fibers are great against weathering and will last for years. 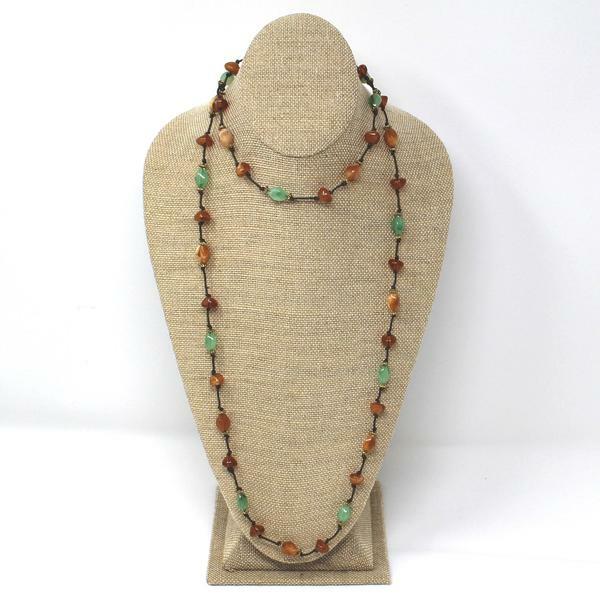 The earthy color of burlap linen displays allows it to make any jewelry piece stand out. This is especially true if these pieces are adorned with multi-colored crystals or gray or black finish. Also, the burlap linen ’s light color makes it more visible to people as it’s easier to see, compared to dark-colored ones. Burlap is considered as an integral component of any rustic or vintage themed style. This is because it evokes the style and simplicity of nature. Burlap is also used in rustic chic weddings or home decor. That said, burlap linen displays are the ones to use if you are going for rustic themed shop interior or want to add some vintage charm to your store. Although they may be perfect with the rustic theme, burlap linen goes well with basically any shop interior decors. This is because they tend to perfectly combine with any color palette without looking too heavy or cluttered. And as mentioned earlier, burlap linen reminds of the simplicity of nature, so it’s easy to match with any shade or theme. 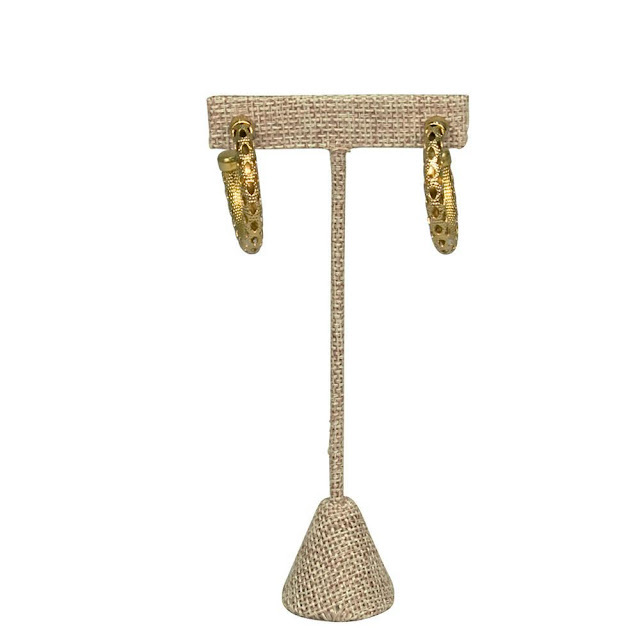 Burlap linen jewelry displays are available in so many designs. 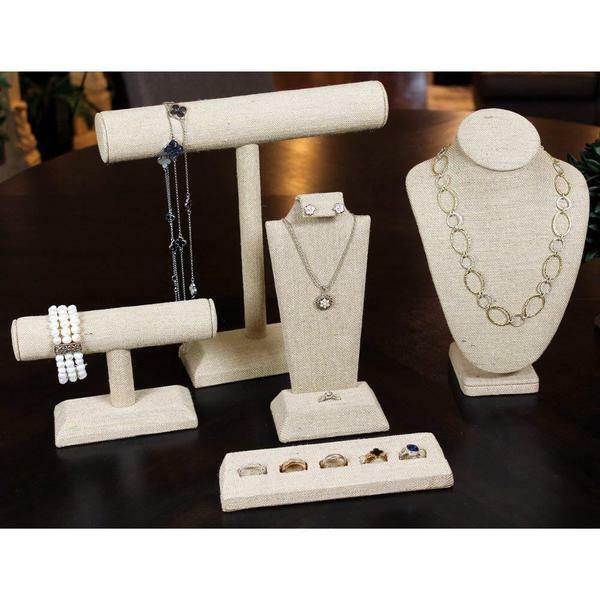 You can get a T-bar, a tray, an earring display stand, a necklace display bust, and even a display set for all types of jewelry pieces. There is so much to choose from so you sure are going to be able to pick one that fits your shop’s needs. Whether it’s for your personal collection or your store, NileCorp.com has a wide array of selections for your jewelry display needs. Showcase your stud earring collection with the best displays. 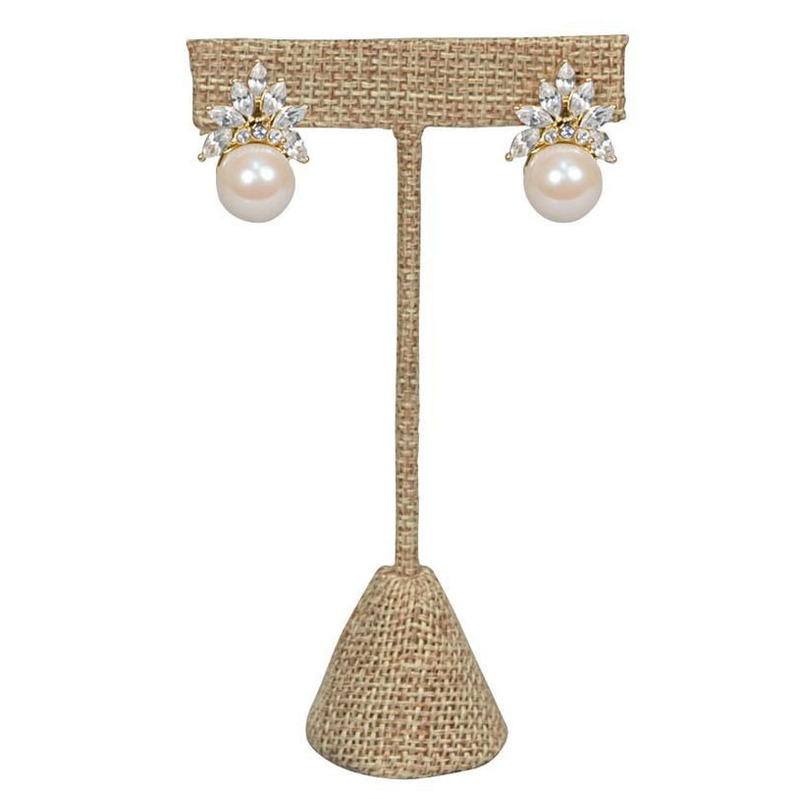 Last week, we put the spotlight on earring displays that are perfect for statement earrings. Now it’s the studs’ turn. 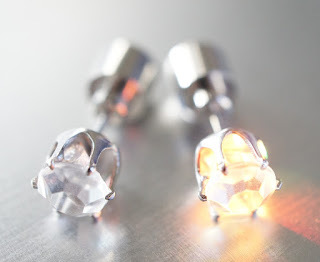 Stud earrings, although more straightforward and simple in design, can still accentuate a wearer’s facial features. 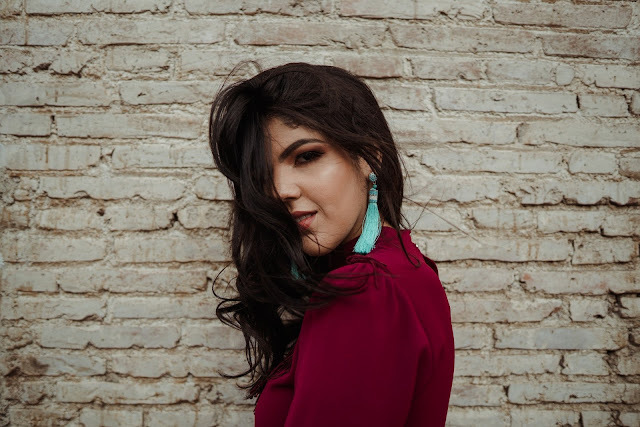 They are the best type of earrings that women of all ages can rock. And without further ado, here are five earring displays perfect for stud earrings that can be used both in shops or for personal displays. 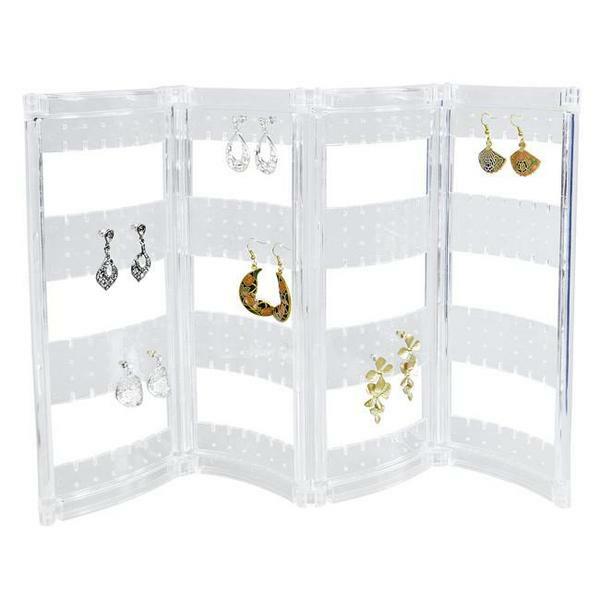 This earring display stand can hold two pairs of stud earrings. The linen cover makes it perfect to use with rustic or vintage-inspired designs. Its unique curved design allows for convenient storage and setup. This stand’s size dimension is 4" W x 1 1/2" D x 2 1/4" H.
Another space-saving display, this display ramp is perfect for when you want to showcase a single design but comes in different colors. It is made of metal and covered in soft black velvet. 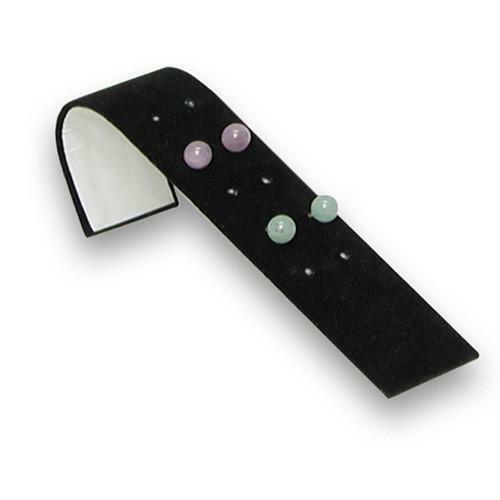 This ramp can hold five pairs of earrings and has a size dimension of 1 3/8" W x 6 1/4" D x 2" H. You can also get this display in white leatherette. This display exudes a fun, spring and summery feeling, making it perfect to showcase your colorful gemstone stud earrings. It features a tree design with four holes for two pairs of earrings. 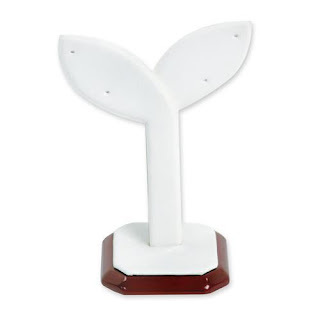 Its weighted base has an elegant rosewood color trim. This display is made of wood and leatherette so it sure us sturdy. Its size dimension is 2" W x 2" D x 4" H.
If you need to highlight a special pair, then this t-shape stand is the perfect one to use. It only has two holes for you to feature a single stud pair. It is made of metal and covered with burlap fabric. Although it’s perfect for vintage-inspired designs, it looks as gorgeous with any kind of style. It also comes with a weighted base so it sure won’t fall over. This stand has a size dimension of 2 1/2" W x 4 3/4" H.
Lastly, this small display stand is also ideal for highlighting a single pair. It has a fun, unique round design that gives off a young chic vibe. It is made of metal and covered in either elegant black velvet or minimalist white leatherette. This display stand has a size dimension has a height of 4 3/4" H.
Want to see more jewelry displays? Check out NileCorp.com and get to choose from a vast collection-- from earring displays to necklace display busts, as well as jewelry making tools and supplies. Pick out the perfect displays for your tassel earrings, drop earrings, and other statement pairs. Earrings can bring the attention to the wearer’s facial features, much more so if they have bold, eye-catching designs. They can instantly level up one’s look, that’s why they are one of the favorite go-to accessories of women today. And whether you are a jewelry shop owner or own a vast collection of statement earrings, having earring displays and other jewelry displays is a necessity. That is why this week, we have picked out five of the best displays that are perfect for bold statement earrings. The T-Shaped Earring Display Stand Set is perfect for minimalist displays and those who want frills-free style. 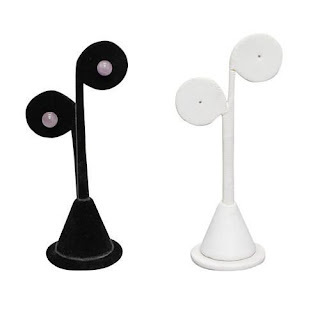 The set comes with two pieces of earrings stands made of high-quality plastic. 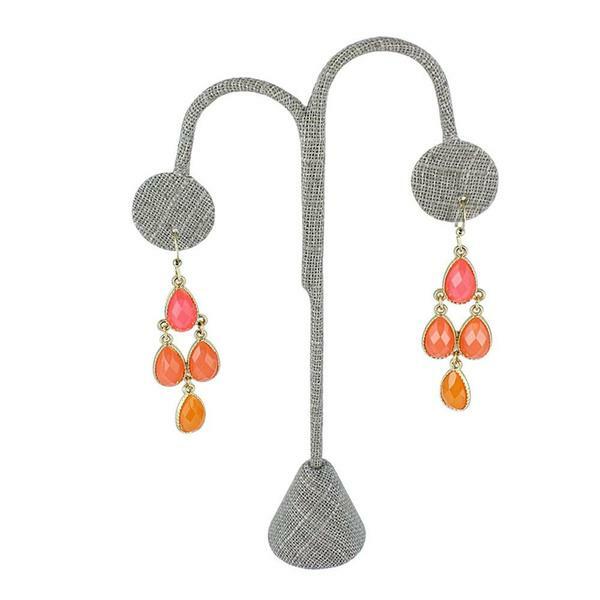 Each has a pair of holes, and its design allows for any long earrings to hang freely. The smaller stand’s size dimension is 2 1/2''x1 1/4''x3 3/4'' while the larger one’s size dimension is 3 1/4''x 1/1/4''x4 ½.'' The T-Shaped Earring Display Stand Set is available in black and clear. 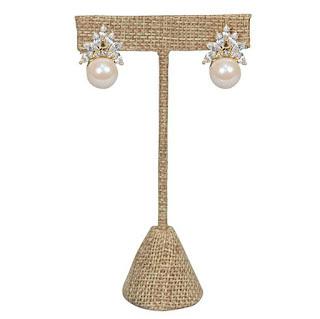 For any spring and summer-inspired pairs, the Large Metal T-Shaped Earring Display Stand Burlap is perfect. The burlap fabric reminds of beach sands and complements any colorful earrings or those pieces adorned with gemstones. Alternatively, it also looks lovely with vintage and rustic style earrings because of its color. 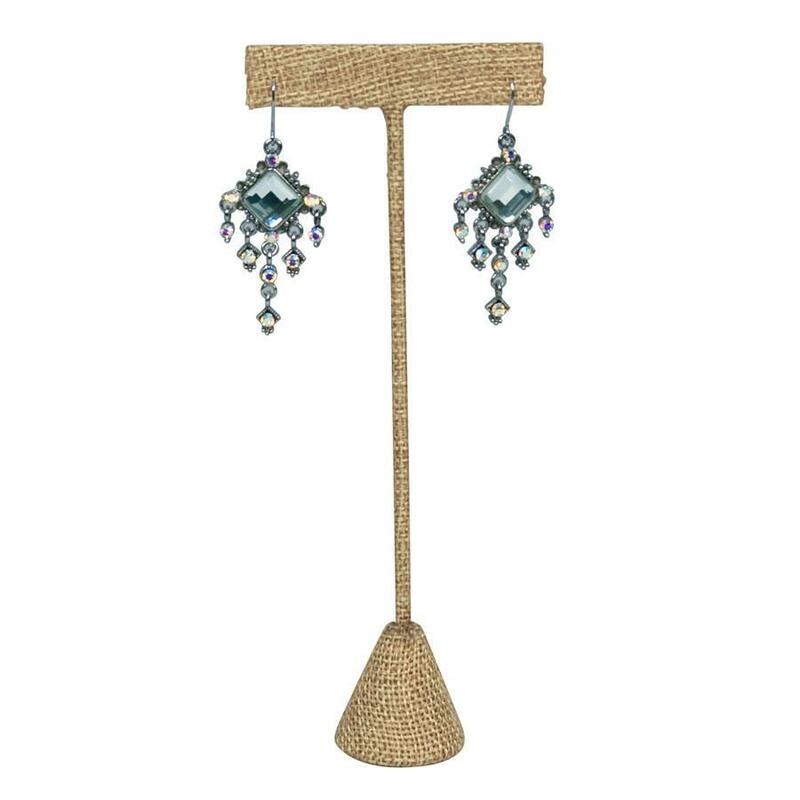 This simply designed yet striking earring stand is made of sturdy metal and covered with burlap fabric. Its size dimension is 2 1/2"x 6 3/4"H.
If you want something that exudes fun and youth, the Gray Linen Earring Display is the one to get. This metal display features a tree shape design and covered in a lovely rustic gray linen. It looks gorgeous with any pair of statement earrings, but they look best used for classic earrings as it exudes a charming vintage touch. It stands at 6 1/4"H, so it’s ideal for long drop earrings or chandeliers. 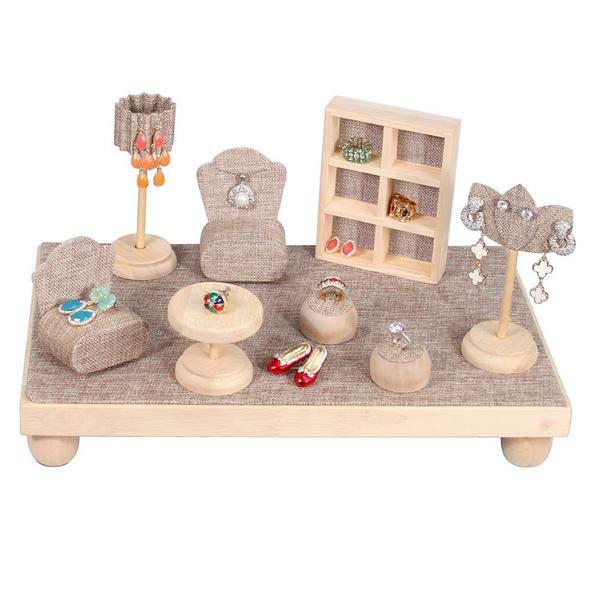 If space is an issue, the elegant Linen Earring Display Stand can hold your earrings without looking too cramped. It’s made of cardboard with a metal easel and covered in linen. The stand’s neutral color makes it ideal for virtually any color and design. Its compact size makes it a big convenience for sellers who go to trade and craft shows. Its size dimension is 2 3/8"W x 1 1/2"D x 3"H.
The Foldable Acrylic Earring Storage and Display Stand is another space-saving display. It can hold up to 216 pairs of statement earrings of any design. It is made of sturdy clear acrylic. Because this stand is foldable, you can store it any time it is not in use. That said, the Foldable Acrylic Earring Storage and Display Stand is also a must-have for those who are trade and craft show regulars. This stand’s size dimension is 11''W x 17''H. Want to see more earring displays? Check out NileCorp.com and pick out from our massive collection of jewelry displays!